Eucalyptus Oil Radiata (Australia) - Ultra International B.V.Ultra International B.V. Native to Australia, Eucalyptus Radiata (or narrow-leafed peppermint) is one of 700 plus identified species of eucalyptus in Australia – yes 700+! 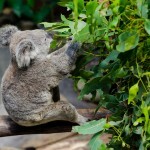 Found all over Australia it is more commonly wild harvested in New South Wales for the production of its essential oil. High in Eucalyptol (60-70%) and low in irritating aldehydes (less than 1%) this is one of the defining characteristic that distinguishes it from Eucalyptus globulus (the more common eucalyptus oil). Radiata is known to be the best eucalyptus for inhaling and diffusing given its gentle status. It is also said to be absorbed by the skin better than the other Eucalyptus oils. It’s also considered one of the most effective eucalypts which is why within the aromatherapy field it is the most sought after. It is recommended for rhinitis, otitis, bronchitis, cough, pulmonary infections, acne, asthma and vaginitis. Eucalyptus radiata is unusual due its odour. Olfactively it can be described as crisp, fresh and camphorous with hints of citrus and light floral notes. Whilst similar in many ways to the more popular eucalyptus globulus (also common to Australia), the odour is much milder, almost fruity giving you an oil with the same benefits, but a more pleasant odour. Too good to be true? Well actually yes. Unfortunately, E. radiata isn’t produced in high volumes and supply certainly cannot keep up with the market demand. The poor economies and supply dynamics push up prices to three times that of E. globulus, pushing the oil into the more specialist market. This supply issue has been prevalent in recent years as increased demand from the aromatherapy markets has been quicker than the supply can accommodate. This is largely due to the cost of harvesting wild trees which can grow to be 30-50m tall. Plantations had been established many years ago but where never properly managed and maintained and any that still exist are under ownership of some institutes or organisations who aren't interested in further investment.